Durham, NH - (BUSINESS WIRE) - December 1, 2003. - Intellitech Corporation, the technology leader in scan-based configuration, debug and test solutions today announced the availability of the PTC, an addressable 1149.1 gateway device. 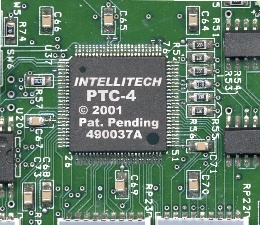 The PTC IC is designed into what is called 'blade' PCBs, boards designed to plug into a multi-slot or multi-cabled backplane. It provides the infrastructure necessary for multi-PCB FPGA configuration and system PCB to PCB interconnect test. It is a key element in designing multi-PCB systems that can perform in-the-field upgrades to all of the non-volatile devices of the system. It's also a necessary element for performing tests of PCB to PCB gigabit SERDES and LVDS connections and diagnosing connection problems to the pin. It can be used on blades targeted for proprietary telecomm backplanes or on PCBs used in standard backplanes such as cPCI, VME and VXI. The PTC, for Parallel Test & Configuration, is the industry's only gateway device for 1149.1 test and configuration of multi-board systems that can scale with the size of the system. The PTC's patent-pending parallel test capabilities using IEEE 1149.1 enable simultaneous test and on-board programming of all similar PCBs in a system. This enables manufacturing PCB tests to be re-used at the system level, during integration and burn-in without incurring test time penalties. "Previous addressable multi-drop 1149.1 architectures lacked scalability. If the test time for one PCB in the system was 45 seconds, then 10 similar PCBs resulted in 450 seconds. Each PCB had to be tested one at a time. With Intellitech's patent-pending technology, the time to test those 10 PCBs would only be 45 seconds", said Mike Ricchetti, Intellitech's Chief Technology Officer. "It is particularly useful in that FPGAs and other programmable devices can be configured and verified simultaneously. It is not necessary to individually interrogate each device on each PCB to see if they were programmed successfully." IEEE 1532, the in-system configuration standard, has become the preferred method of programming devices such as CPLDs and FPGAs. The PTC shortens the design time for creating a multi-PCB IEEE 1532 compliant bus throughout the system. With parallel FPGA configuration, the PTC can achieve higher FPGA configuration data rates than proprietary methods, with less design time and lower parts cost. For example, FPGAs are configured at power-up using the FPGA vendor's proprietary 8 bit wide interface. The proprietary interface supports programming the FPGA at data rates from 1mb/sec to 152Mb/sec, with 80Mb/sec typical. However, this proprietary interface must be local to each FPGA, requiring configuration resources on each PCB in the system, increasing the parts cost. Using a 20Mhz test clock and the PTC architecture, 4 PCBs can be configured from a single programming resource simultaneously, providing an aggregate data bandwidth of 80Mb/sec, matching typical proprietary configuration data rates. With just eight (8) like PCBs in the system, the FPGA configuration speed over the serial PTC bus is 160Mb/sec exceeding the highest 8 bit wide configuration data bandwidth. As the system complexity continues to increase, functional testing as the sole means of verifying product quality is becoming more complex and more expensive. Testing and diagnosing faults on high-speed differential signal, gigabit SERDES connections for jitter, noise, and crosstalk is a challenging task to accomplish with CPU based diagnostic software. Diagnosing backplane problems to the pin is not possible without 1149.1 assisted structural test. Prudent OEM's are designing DFT into their multi-board systems to enable this PCB to PCB interconnect testing and 1149.1 assisted BIST functions. "We see IEEE 1149.1 as the test and maintenance bus used throughout the system to enable comprehensive system test and in-the-field updates", said CJ Clark, Intellitech CEO and past IEEE 1149.1 chairperson. "IEEE 1149.5 has been withdrawn as a standard, as it didn't address these issues or allow for scalable multi-vendor PCB test and configuration." "In the past, serial EEPROMS and FLASH were updated in the field over several separate functional busses. This added to the complexity of the system and the engineering involved. Today, OEMs are seeking to lower their overall product cost with a unified approach to in-the-field updates and multi-PCB test. The PTC is the first IC of its kind to address this problem", he added. The PTC was first designed into a customer system back in 2000, this early adopter now has systems deployed with up to 25 PCBs, each using a PTC and connected over the patent-pending parallel test bus. The details of this success will be published in a future press release. Intellitech is a registered trademark of Intellitech Corp. PTC and the Parallel Test Bus is a trademark of Intellitech Corp.